Combining the fuselage of the Alouette II with the dynamic performance of the Alouette III, the full-size SA 315 Lama helicopter was designed for flying in hot regions and high mountainous terrain, and gained great respect for its performance in those areas. 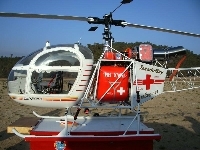 Aerospatiale developed the SA 315 in response to India's requirement for a high-performance helicopter suitable for use in the Himalayas (the highest mountain range on Earth, located between Tibet and Northern India), and a similar requirement by the South American air forces flying in the Andes. 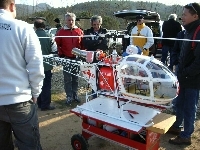 The machine first flew in March 1969, although at that time it was devoid of external differences from the Alouette II. Apart from the taller skid landing gear, without wheels, the main difference is the electronic equipment in the cockpit. The Lama is capable of transporting external loads of up to 1135 kg on the external hook, and set up an altitude record of 12,442 m in the Summer of 1969. The SA 315 B was built under licence at Hindustan Aeronautics under the designation Chetak; according to legend this was the name of a faithful horse in the battle of Haldi Ghati in the year 1546. The Lama has proved its capability and reliability by successfully taking off and landing at altitudes of 7500 m above sea level. 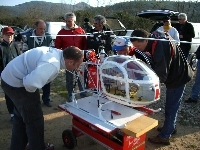 The machine has found many applications, including transport and rescue helicopter in the Austrian and Swiss Alps. 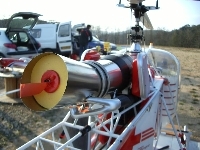 The Alouette II and Lama were the first full-size helicopters to be fitted with turbine engines, so it is only appropriate that we offer a turbine version. 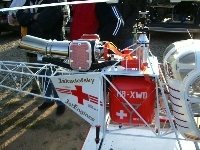 The Lama kit for the Jakadofsky Limited Edition includes a completely assembled fuselage and chassis consisting of soldered stainless steel components, ready-made welded aluminium landing gear, and GRP cabin and tail. 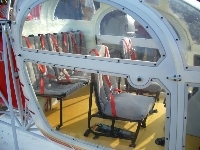 The mechanical components are specially designed for use with the specified turbine. The imposing fuselage is very long, but the entire tail boom can be removed by undoing just three screws. The ballraced tail rotor drive shaft is made of 8 mm Ø stainless steel. The dome and swashplate guide are also included in the kit. The working doors are 340 x 310 mm in size, and they feature a raised ridge in the GRP frame for increased rigidity. For the turbine version, a 3-blade rotor head will be offered as an optional upgrade in the foreseeable future.